This month (Wednesday 7th October), we'll be bringing the glamour of Hollywood movie-making to Web Wednesday! Our guest speaker will be Jennifer Thym (@jenthym), the writer, director and producer of "Lumina - The Web Series", Hong Kong's 1st foray into distributing and marketing a fantasy thriller via the web. Jennifer will be joined by members of the cast (actors, videographers, musicians and producers) so don't forget your autograph books! Sign up for the event on Facebook, LinkedIn or via this blog. LUMINA is free to view on their website (luminaseries.com) and their YouTube Channel (youtube.com/luminaseries). Being very web marketing savvy, Lumina fans can also keep updated via Twitter, Facebook or AliveNotDead. Within two weeks of launching, Jennifer had already signed a distribution deal with KoldCast.tv in the US. 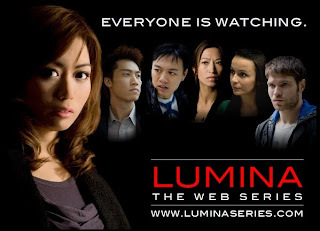 As Jennifer describes it: "Filmed on the RED One and starring JuJu Chan, Michael Chan and Vince Matthew Chung, LUMINA is a dark, densely woven fantasy set against the sparkling backdrop of Hong Kong. Lumina Wong (JuJu Chan) is beautiful but works far too much; although she lives in a city of millions, she still feels lonely and isolated. Late one night, Lumina has a chance encounter with Ryder Lee (Michael Chan), a handsome young man from another world that she can see in mirrors and darkened window reflections. She revels in the fantasy relationship until mirrorspy Eben Sanchez (Jacob Ziacan) comes into her life, warning her of the treacheries of the people of the Dark Realm. Soon Lumina must choose between the safety of the world she knows and the deadly allure of the unknown." The night kicks off at 6:30pm and ends around 9:30pm, so you'll have plenty of opportunity to mix with the movers and shakers of our local Internet and meet some talented local artists! There will be an entrance fee of HK$100, unless you're a bona-fide student, in which case it's HK$50. This includes one complimentary drink. All other drinks are at Happy Hour prices. (We will issue a receipt, if you require one). We will donate 10% of entrance fees to Oxfam's relief work in Philipines and Vietnam in the wake of Typhoon Ketsana. Do invite budding producers and entertainment gurus to join the Asian Digerati on Wednesday 7th October at Volar, Basement, 38-44 D'Aguilar Street, Lan Kwai Fong, Central. Fame and Fortune - Prizes at Web Wednesday!